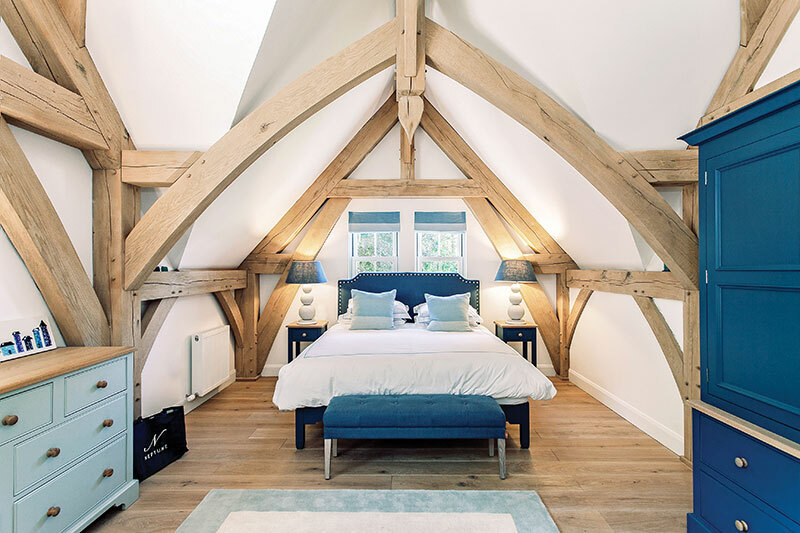 One common misconception shared by many self-builders is that wood is an old-fashioned material for a house. Yes, it’s beautiful, but is it really up to the task of providing the kind of energy-efficient, well-insulated homes we all want today? In fact, in the right hands, high-quality timber is ideal, as this new-build in the Fife coastal town of Elie demonstrates. Highly energy-efficient, thanks to state-of-the-art insulation, it makes a robust, characterful and surprisingly affordable home. 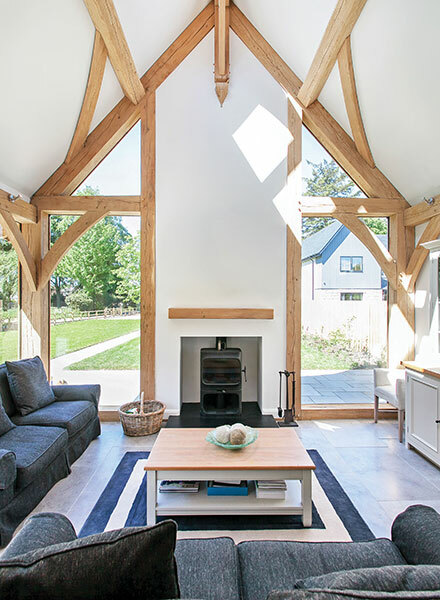 The timber-frame specialist Oakwrights, working with Thomson Hunter Architects, was asked to bring the owners’ brief to life – a house that flowed and was full of personality and beauty, yet which worked as a family house incorporating modern conveniences, good storage and functionality. 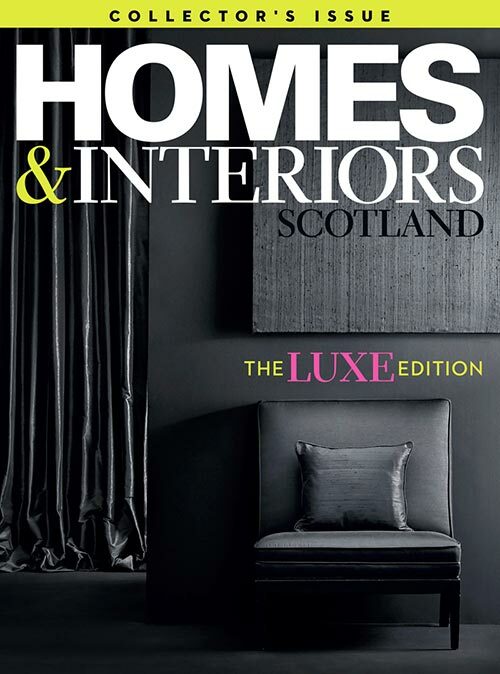 The clients also wanted an impressive staircase, a dining space and open fireplace in the hallway, and a chance to apply some of the design ideas they’d picked up on their extensive travels abroad. The site, which had been sold with outline planning permission, had a number of challenges, such as a long, narrow shape, and the fact that even though it was in a beautiful rural setting, it didn’t really have any significant views. “That meant it was imperative to create internal views and privacy for the house and garden,” say the architects. The design they came up with has two wings, with a turret as the hinge. The larger two-storey wing works its way down the length of the garden, falling in height as it does so, culminating in a double-height lounge. 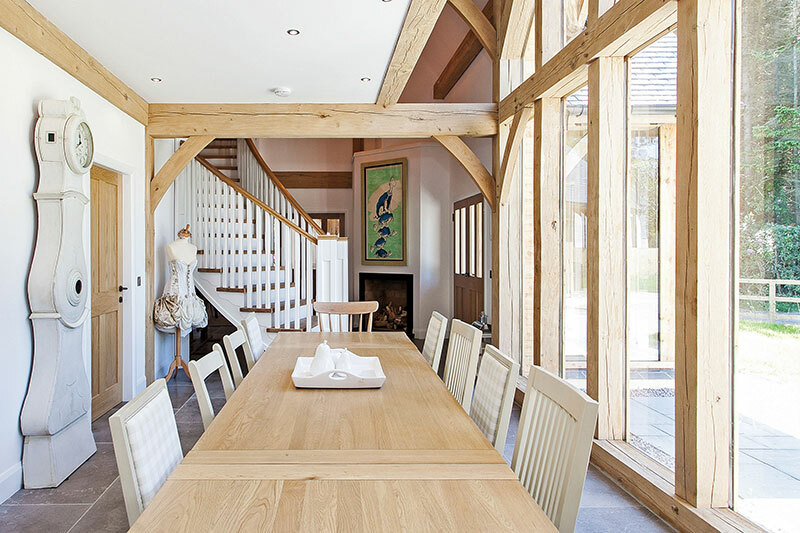 The post-and-beam oak frame allows a series of external porches to be created, while inside the house the frame is dramatically expressed in the vaulted ceilings of the upper floor and in the double-height living areas. There is also a garage with accommodation above. The scheme was well received by the planning department, and full permission was granted within a few months. 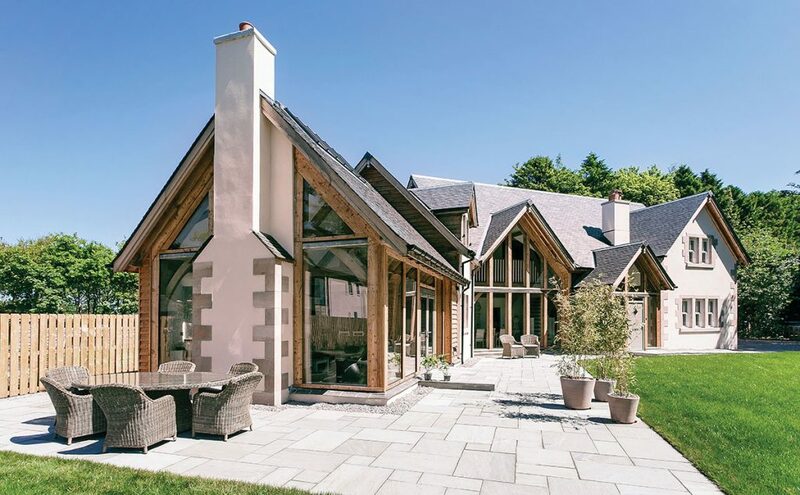 The 12-month build by contractor Iain Hendry and Oakwrights was also straightforward. Completed early last year, the 380 sq m house (built at a cost of around £2,200 per sq m) has an open-plan arrangement of entrance hall, kitchen and dining area, breakfast room and two living areas at opposite gable ends of the ground floor. Utility spaces requiring less light are sited to the back, along with an en-suite bedroom and study. 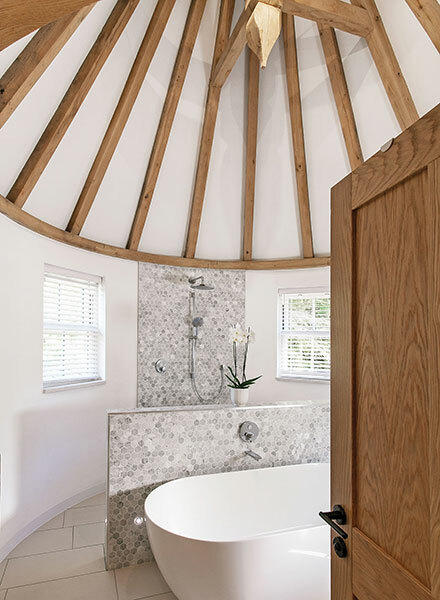 There are three more bedrooms on the first floor beneath the vaulted ceilings; the master bedroom’s circular en-suite, in the turret, is particularly striking. 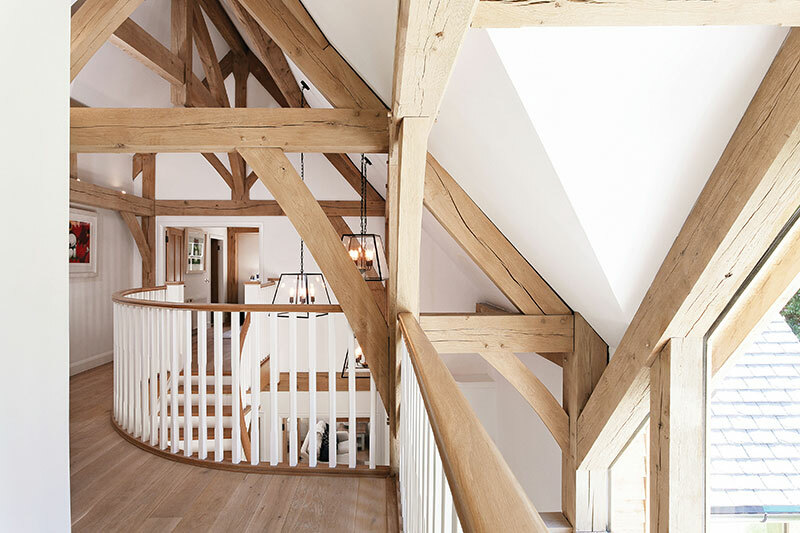 The owners’ wish for a statement staircase was also granted: the architects designed it as a sweeping curve in oak, with a simple painted balustrade, leading up to the bedrooms. The house is very energy-efficient, thanks to Oakwrights’ encapsulation system of prefabricated insulated panels. Underfloor heating works in tandem with an air-source heat pump that provides heating and hot water. There are three fireplaces too; the woodburning stove is a focal point in the glazed gable of the lounge, and the open fireplace in the dining hallway is one of the most attractive features of the house, making the building feel warm as soon as you enter. White uPVC sliding sash windows with astragals and Pilkington argon-filled glass were chosen for energy performance, operation and looks. 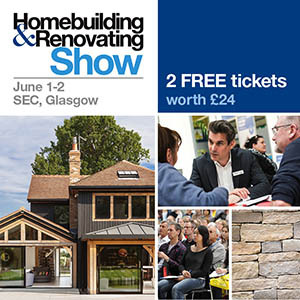 The exterior, meanwhile, is clad in stone, larch and white K-Rend render, with a roof of Spanish Cupa slates that were chosen both for their 100-year guarantee and their similarity to Scottish slate. A key element of the design was allowing the internal spaces to flow into the garden. Patio doors and glazing to the ground floor were incorporated into the plans to provide this link, with the main living spaces positioned to take advantage of the view down the garden. The owners took charge of the interior design, based around a simple colour scheme of whites, greys and light blues. The floors are engineered oak and grey limestone. 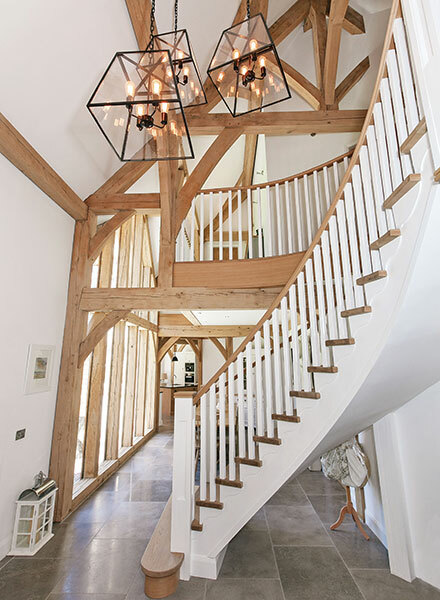 Internal and external spotlights and uplighters, meanwhile, have been positioned to show off the structural features and textures of the oak frame.